Halloween has become one of the largest holidays in the U.S., but not everyone wants to celebrate Halloween by Trick-or-Treating. 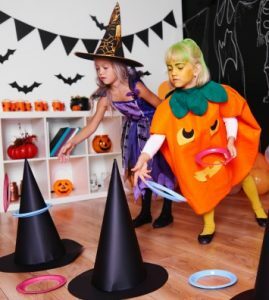 If you are looking for fun things to do on Halloween, that isn’t trick or treating, here are several alternatives to trick or treating. There are many different reasons families have for not wanting to trick-or-treat. From finding it to be a safety hazard due to the neighborhood you live in or if you live in the country, it’s hard to get to the houses to trick-or-treat. Or, maybe you just don’t enjoy trick-or-treating and neither do your kids. Food allergies might be another reason you are looking for something else to do on Halloween, instead of going door to door. 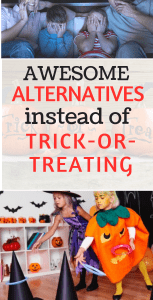 Thankfully, there are so many alternatives to trick or treating that you won’t even miss it! Make it a Movie Night – Halloween Themed! If you want to have a quiet evening at home, this is a great way to do it. Especially, if you have a sick child that isn’t able to go out, having a Halloween movie-a-thon is the way to go. There are a ton of different Halloween movies and TV shows that are great for kids of all ages. You can watch The Great Pumpkin Charlie Brown with younger kids, or try Hocus Pocus or Coraline if your kids are older. If your child’s stomach is up to it, make some popcorn or a special Halloween treat and snuggle on the couch and watch the movies! Another great trick-or-treat alternative is to have a Halloween themed game night. If you don’t want to do specific Halloween games, you could incorporate candy as your theme. So a Halloween candy inside a pinata. Or the winner of your favorite game wins Halloween candy as the prize. A lot of kids love crafts, especially holiday-themed crafts. Luckily, there are a lot of Halloween themed crafts you can make. The craft night could focus on one large craft that would take a while to complete, or you could have several smaller craft projects planned. If you decide to do the smaller craft projects, set up different stations around your family room or around your house with a different craft setup at each location. 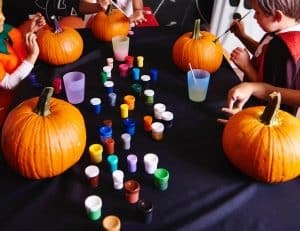 Some fun crafts ideas might be to carve or paint pumpkins if you haven’t already. Another fun idea is to craft out a game, such as “Pin the Stem on the Pumpkin”. In order to create this, someone(s) could paint a large pumpkin on paper and then hang it on the door or wall. Some stems should also be painted and then cut out. If the reason you aren’t trick-or-treating is because of safety concerns, you could go to a local Trunk-or-treat. This is an organized event at a local church, school or other organization. Everyone brings their vehicles in, opens up the trunk and puts in bowls or bags of candy. The kids can walk to each car to “trunk-or-treat”. Most of the time there is a party after. You may find this to be a fun and safe alternative. 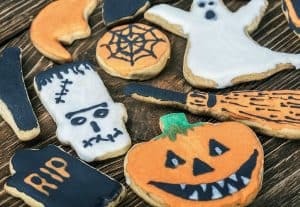 Another fun Halloween activity that is sure to be a hit with kids is having a cookie decorating party. Bake a lot of cookies up beforehand in different Halloween shapes, plus a lot of frosting in different colors to set up around the table. Make sure to have different types of decorations for the cookies, such as different sprinkles and different tips to apply the frosting to the cookies with. If you found this post helpful, I’d love for you to “pin it’!